In the past two years or so, one of my most popular topics and the one that I've been asked to spend most of my time on is mashups. Notably, this topic seems to be popular across a widely diverse range of my audiences and across many countries and cultures. My recent audiences have spanned four continents, and included such diverse group as IT professionals and CIO’s; commercial sales executives; military organizations; technology-enabled learning and e-Learning professionals; and higher education professors, deans and ministers. Given all the interest, I thought a short summary of the topic, along with some recent examples, was due. Hence... today’s post. The future is a Monstrous and Marvelous Mashup! Even more simply (and a surprisingly robust metaphor for it) is that mashups are like Lego blocks; you have a lot of small components which can form almost infinite numbers of assemblies to create just about anything you can imagine. With mashups, the ‘bits and pieces’ or individual Lego blocks are pre-existing things that can come from any source and often from multiple sources. Furthermore, these “bits and pieces” can truly be just about anything and everything, from content to code to hardware to events to teams. Mass contribution and mass customization are part of the deeply pervasive metapattern of mass personalization, which Erik Duval and I refer to as "The Snowflake Effect." All of us are becoming increasingly enabled by mashup technology and the plentiful availability of mashable objects. We are becoming mashup creators ourselves. Fewer programming skills are required, and many essentially require none, so we can focus on finding and assembling the specific components we want to put together into a unique assembly. You can get a sense of the depth and diversity of mashups by spending a few minutes looking at some of the examples listed by the likes of WebMashup.com. Perhaps because my audiences who work in information technology (IT), as well those who are CIO’s, have shown such an interest in mashups, I took note of today’s posting (July 23rd, 2007) "A bumper crop of new mashup platforms" by Dion Hinchliffe and his previous posting from May, Mashups: The next major new software development model?. Dion’s blog, Enterprise 2.0, focuses on “leveraging the convergence of IT and the next generation of the Web”. He too makes note of this shift in focus from the current practice of creating “raw components” to creating assemblies instead. In the larger context, I’ve noted that this is also bringing with it a rethinking about the scope of design and how we are all becoming “designers”. As we create these assemblies of solutions to match our unique requirements, context, and situations. we are becoming more involved in design and design related tasks. In other recent news, I saw a good example of the Snowflake Effect and mashups on TV, or perhaps better put, in video content. 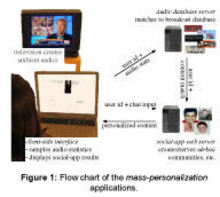 This example is called Chime.tv and you will find a good summary and even better video coverage on David’s posting "Chime.TV’s subject-based channels cut across Internet video sources with one UI". Even more apropos to today’s topic of mashups, Chime.TV is but one of the many examples coming out of the recently completed Mashup Camp run by David Berlind and others from Ziff Davis. David posted some of his observations on mashup trends yesterday in his posting Mashup culture shatters crusty, stodgy old approach to business app dev. Returning now to this idea about mashups as a conceptual model, I want to recommend that you look at these examples and consider how mashups fit into your world and work. Consider that mashups also apply to people! Think for example about putting together a great project team. Ideally you want to be able to find just the right collection and combination of individuals who possess just the right set of skills, knowledge, experience, and attitudes (the Lego blocks) to form a new “assembly” that best matches the needs of the project and the context of the specific situation. Or consider how valuable it will be to be able to find just the right individual(s) to meet and talk with at a conference, in an online chat, or on IM. Rather than leaving this to serendipity (even as powerful as I believe that to be), imagine a future where you and we collectively can start to increase the probability of finding “just the right” people to create the mashup of individuals you need. To some extent, this is already happening at some “unconference” events and more broadly with the newest “dating technology” whereby changing the context from romantic to professional or other purposes, the exact same technology can be extremely effective at helping you to find the right people to talk with, work with, and meet with. I’ll continue to keep an eye on mashups and talk more about some specific applications and diversity in future postings. In the meantime, send me some of the ways you are going to mashup your world. This may sound “off course” but it sure is “on target” to improving our overall learning and performance, don’t you think? 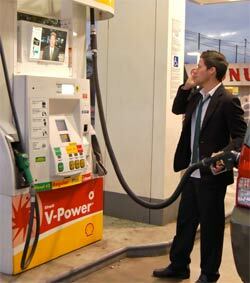 P-Learning: Fill up your tank...and your head? 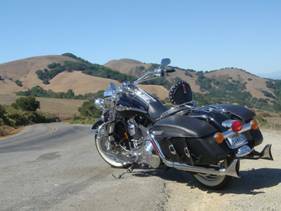 I’m finally off the road long enough to get out on my Harley to enjoy both the great weather that we’ve been having lately in sunny California and some of the great winding back roads you can see in this picture. However, even at almost 50 miles to the gallon (or about 5 liters per 100k as I would have said when I lived in Europe), enjoying all those lovely miles means that I have to stop to fill up the gas tank once in a while. So there I was, calmly filling up the Harley with a whole 4 gallons of gas when a voice from above started to talk to me. No, no, not THAT kind of voice! I looked up to find a large LCD screen installed on the top of the gas pump. As I sat there filling up my tank, the monitor tried to fill up my head with information someone felt I just had to have. That’s right folks. Just when you thought there might be some escape, along comes “Gas Station TV”, offered in this case by the company of the same name. Programming on the pump starts when you put in your credit card and it repeats until you finish your fill up. My other vehicle is a pickup truck with a MUCH larger tank than my Harley, so I expect to hear several loops when I’m filling it up! Of course, I needed to find out more and sure enough, I found an article on Gearlog called “Watch Pump Top TV at Your Local Gas Station”. The advertisements (was there any doubt?) were annoyingly frequent and the ratio of ads-to-content was way too high. If they want to be effective and not drive us all away, then they will need to come up with much better marketing models. Perhaps they could follow the success online by placing the ads off to one side or the bottom and let the content come through the majority of the screen space? The sound was too loud! When the station is busy and every pump is playing a different part of the same loop (the “show” starts when the pump starts), it gets VERY annoying very quickly. It will take a while to settle on what type of content is best for this venue. For example one segment gave the local weather forecast and an updated traffic report. Smart and helpful, so I appreciated that. I could see them adding driving tips, how to get better mileage and an option asking me if I need directions to my next destination. While I understand that we are a “captive audience” in these situations, smart installations could give us more control, resulting in greater effectiveness. For example, they could provide a volume or mute button to let me control the sound, and they could follow the Web example (most of the time) by not having any sound from advertisements unless I choose to let it play. Use some of my chosen preferences to give me more relevant information. Know which vehicle I’m driving (ask me on the touch screen if I have more than one), and provide me with information specific to that vehicle. Know the kind of content I’m most interested in during these situations—maybe I’m more interested in the weather than sports scores, or I might want different information depending on the time of day. Offer a large series of content so that I could choose those segments that are relevant for me. Then they could keep showing me new content for as long as I’m there, rather than just repeating the same loop ad nauseam. Still, like it or not, I imagine that this trend will continue to show up at more stations. If used well, this could be an example of modular learning that is good for both the consumer and the producers. So, next time you are at the gas station, don’t be frightened by the voice from above (well, maybe be very frightened?). Just look up and see this latest example of the digital surroundings we are living in. Gas Station TV is more evidence of the trend line I’ve covered previously here at Off Course – On Target—the increasing presence of "digital screens" where literally any surface can become an interactive display. 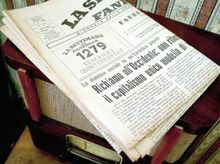 Read more about it in my postings "The Old Medium has become the New Content" (Part 1) and (Part 2). The upside of living in a market-based economy is that we are the market. Ultimately, we ARE in control, because we can vote with our feet and our wallets. My suggestion? If this trend of almost all surfaces becoming digital interactive displays is inevitable, as I believe it is, then let’s start coming up with ways to use it to our advantage. Let's make them into another opportunity for learning moments. In some of my recent postings (“The Old Medium has become the New Content” Part 1 and Part 2), I expressed my admiration and respect for the many prescient remarks that the late, great Marshall McLuhan made about the media, including “the medium is the message”. In keeping with this notion that “the old medium becomes the new content”, I thought many of you would enjoy a posting on YouTube which a good friend and colleage, Gerry Lang from Intrepid recently brought to my attention. This led to some additional exploration and I turned up two others that seemed to have a story that I'd like to relate here. First, Assistant Professor Michael Wesch at Kansas State University, USA has posted a video clip with the apt title of “Web 2.0 … The Machine is Us/ing Us” (click on the image below to watch) Wesch not only provides a comprehensive explanation of the collection of recent Web-based technologies and the era of the Web popularly known as “Web 2.0”, he does this in less than 5 minutes! In addition, he uses the medium itself to great advantage to make his points. If you check out Wesch’s notes about this posting (click “This …. (more)” to the right of the video), you can see that he matches his work to his message, because he says that this is his 2nd draft and requests that you send him suggestions for improvement. “Deus offers music under a Creative Commons Attribution-NonCommercial-ShareAlike 2.0 license, yet one more example of the interlinking of people sharing and collaborating this video is attempting to illustrate." This same license covers all the content you find here at Off Course-On Target. If you are interested in using Creative Commons license to distribute some of YOUR content so that everyone can readily use, reuse and repurpose it, check out the new v3.0 of Creative Commons license. The second part is an example of user-generated content in the form of a follow-up response to Wesch’s clip by “Corey the Raven” that shos how such works can stimulate good responses from others. This is not only a good response but one that again uses the medium to provide part of the message. And the third part is for those of you who are either new to Web 2.0 or find it all quite confusing. It's a more "traditional" presentation style simple called “Web 2.0” created and posted on YouTube by Jeff Utecht from Singapore, China. Jeff offers a more factual overview of the history of Web 2.0 and does a good job of providing specific examples to illustrate the difference between Web 1.0 and 2.0. I enjoy these video formats and think they provide an excellent form of content and medium. They also underline the need to provide additional formats. For example, a text transcript of these videos or perhaps a set of “stills” (such as slides) would be extremely helpful so that you can discuss them later, pick out specific parts, and reference them. Wesch seems to agree and has added the transcript for “The Machine is Us/ing Us”. Or if you prefer to try out your own version of using alternative mediums to get your message across, you can provide your comments via video and audio. In my own attempt to “lead by example” and “walk the talk”, I provide a full text transcript with each of my audio podcasts here at Off Course-On Target. Of course, I probably need to provide an audio version of each text-based blog entry as well. I may be able to meet this requirement using some of the new automated text to speech converters. I’m working on that now. In the interim, as we share and exchange our ideas, we can benefit from having multiple mediums and formats for the same messages in order to achieve maximum transfer and value. While not every message will require this, the availability of such formats as illustrations, video, audio, and text for the same message seems to provide a richer and more provocative experience. This, in turn, tends to stimulate responses in kind and goes a long way toward increasing the creation of new content and knowledge for and by us all. In my previous entry, I pointed out that the current distinction between a TV and a “computer” is becomingly increasingly arbitrary and irrelevant. TV, the old medium, is transforming into content. An explosion of “digital surfaces” everywhere--on cell phones, cameras, desks, appliances, airplane seats, and billboards, and even mirrors—is just the beginning of Marshal McLuhan’s profound observation that as our communications evolve, the old medium becomes the new content. Lest you should think that we have just about hit the limit of how many different screens, displays or digital surfaces you can be surrounded by, brace yourself for “digital paint” and “digital paper”! Based on what I'm privilege to see in research labs for the past few years, the introduction of this technology into the marketplace can’t be far off. If you are not familiar with this concept, imagine a substance at the molecular level where each molecule is a tiny sphere where one half of its surface is black and the other half white. Each black and white sphere can easily be controlled by electrical input so that either the white or the black side is facing up. Now simply mix this substance into paint or wood pulp or plastic and you suddenly have the ability to make ANY surface digital and capable of displaying ANY image you’d like with almost infinite resolution. You can see the possibilities. Imagine binding a few pages of digital paper together to create truly digital books! Oh, and note that the images on this digital paper can move so suddenly that you can be watching “TV (the content) in a book.” Just throw in some other colors with those black and white molecular spheres and we’ve got color screens literally EVERYWHERE! An equally frightening and exciting vision for most of us, I suspect. To add even more to your degree of excitement—and fright—the surfaces will include “proximity detectors” that know it is YOU who is nearest to them so they can display highly customized content based on what you are “broadcasting” or what the system behind the surface knows about you. I strongly recommend that we stop using these terms of TV and television to refer to a device or a medium and understand instead that this previous medium has now transformed into content (see Fortune magazine’s article “TV is Dying? Long Live TV!”) While we are at it, let’s reconsider terms such as “computer” or “computer screen”. These too will soon be antiquities that future generations will find “cute” and “quaint”. Instead, let’s understand that McLuhan had it just right with his comment that the old medium becomes the new content. A lifelong vision of mass customization and ultimately, personalization of content, context, competencies. A future where every person on the planet is able to have deeply personalized learning experiences daily. So the challenge (and a grand one it is!) 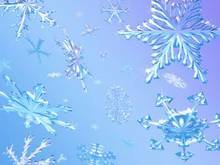 is how do we get what I call the Snowflake Effect: just the right stuff to just the right person(s) at just the right time in just the right way on just the right medium (and likely a few other “just rights”). More to follow as always. Why is it that whenever something new and innovative comes along, one of the first reactions of the press and pundits is that it means the elimination of whatever went before? When television was first invented and began to become popular, the “conventional wisdom” was that it meant the end of radio. Who would want to listen to a talking box when you could have talking pictures?! Well I don’t know about you, but when I last checked (this morning) radio was an even more viable medium than ever. TV certainly changed radio and how we listen and interact with it, and I’m not sure there are too many households sitting around the radio listening to programs in the evenings. But far from being eliminated, it seems that radio is currently experiencing its own revival via the likes of Internet-based radio and satellite radio. And for me, podcasts are an extension of radio, bringing back a flood of a new, more vibrant and relevant form of “talk shows”. This is all very different than in the past to be sure, but to my way of thinking, it is also vastly improved, reaching more people and having a greater impact than ever. Similar predictions have been made about other innovations: eLearning meant the end of classrooms and teachers, online sites meant the end of newspapers, DVD’s meant the end of movie theaters...and the list goes on. After observing this phenomenon for many years now, I can only conclude that it is an odd characteristic of human nature, and we just need to try to learn more from these lessons of the past and match these realities to our predictions and expectations. Earlier this week (January 21, 2007), I read about this very same syndrome being applied to some new developments. In this case, Bryan Appleyard made some interesting commentary in his UK Sunday Times column with the headline “Could this be the final chapter in the life of the book”. This was his reaction to the likes of Google, Microsoft, and Amazon to scan the content of a majority of the world’s books and make this content discoverable online. Back in 2003 Amazon started to “unbind” books it offers with the introduction of their “Search Inside the Book” project which will help you find the exact page and associated text and context you are looking for. They have gone on to add programs such as “Amazon Pages”, which “unbundles” these digital books so that customers can have online access to any page, section or chapter, and a program called “Amazon Upgrade” which will allow customers to "upgrade" their purchase of a physical book on Amazon.com to include complete online access. Google got involved in 2004 when they introduced a program they initially called Google Print to “help users search through the oceans of information contained in the world's books.” In December 2004, Google extended this idea when it made a deal with five libraries—NYPL (New York Public Library) and the universities of Stanford, Harvard, Michigan, and Oxford—to scan their stocks, making their contents available online, and renamed the service Google Book Search. Ultimately, they predict that some 30 million volumes will be involved and they claim to be scanning about 3000 books per day, a rate that would translate into more than 1 million books per year. Microsoft and MSN have also been working on similar “book search” projects that scan printed content and make it accessible online. In November 2005, they made a deal with the British Library to scan 100,000 books from its vast collection with over 25 million pages to be scanned the first year alone. And in June 2006, the universities of California and Toronto agreed to lend their collections of out-of-copyright material held in trust. In concert with the Open Content Alliance, Microsoft will scan and index the materials for use in its Windows Live Book Search. This month (January 2006) they also plan to add books from the New York Public Library, Cornell University and the American Museum of Veterinary Medicine, which are being scanned by robotic machines. "We are working on a platform that will let publishers give readers full access to a book online." From this, Appleyard concluded that "We are, it seems, about to lose physical contact with books, the primary experience and foundation of civilisation for the last 500 years." Of course, Appleyard may well be right that as the content of books becomes available to us online (as I would believe is inevitable and will happen much faster than predicted), it will change both the way and the amount we interact with physical books. But how the form or medium upon which text is transferred has anything to do with how it is used and interpreted is beyond me. "...it is the teachers who will have the final say. They will determine whether people will read for information, knowledge or, ultimately, wisdom. If they fail and their pupils read only for information, then we are in deep trouble. For the net doesn't educate and the mind must be primed to deal with its informational deluge. On that priming depends the future of civilisation. 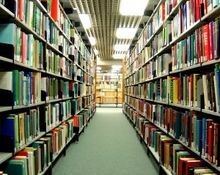 How we handle the digitising of the libraries will determine who we are to become." But fortunately some reality prevailed in the form of good commentary from several other sources. A UK colleague of mine, David Worlock of Electronic Publishing Services, who was also speaking at Unbound said, “Ultimately it’s not up to Google or the publishers to decide how books will be read. It’s the readers who will have the final say.” Here here! And from down under, Stuart Corner on ITWire provided reactions to Appleyard’s comments that I would strongly agree with. “Lynne Brindley, chief executive of the British Library, refuses to see this in apocalyptic terms. With 100,000 of her books being scanned by Microsoft this year, she regards the ultimate digitisation of the library’s entire 150m-item collection (journals included) as 'a wonderful outcome, though I suspect I’ll be long dead by then.'" I was just delighted to finally see some acknowledgment that the majority of the world’s content is NOT yet available on the internet at all! Books are but one great example, especially those in most libraries. Then there are related issues of the degree to which most information in magazines (and especially journals) are still difficult to discover online. Yet to listen to some people, you’d think that if content doesn’t show up in a search result, it doesn’t exist. I, for one, can’t wait to have this mass transfer of content to digital forms occur and for it to be accessible for mass discovery. And I suspect that as noted in my upcoming podcast “Living in a World of Exponential Change”, this will happen MUCH sooner than expected. Now we just need to shift the focus from searching to finding! But that’s a topic for another posting.